Where can I get more detailed information about the holidays? You can find detailed itineraries on the web page for each holiday. This gives a summary of the rote for the day and likely distances. We are always happy to talk through itineraries if you want to give us a call, or email us. How do we decide which tour is right for us? 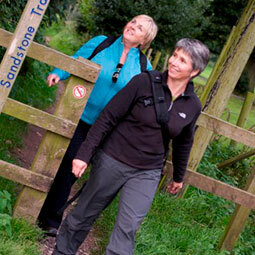 All our walking and cycling holidays are graded to help you choose. We grade routes from gentle, moderate to strenuous. On cycle routes, in gentle countryside, 20 miles will probably take someone who doesn't cycle regularly 2 -3 hours, so there's plenty of time for a leisurely lunch and exploration. Generally routes cover 15-25 miles a day through gentle countryside and can be managed by most people. We also have longer more demanding routes for keen and regular cyclists. Gentle walks are 4 – 6 miles and moderate walks about 8 miles. People do walk at different speeds, and it does depend on how hilly it is, but as a guide most people can walk 2 – 2½ miles an hour as long as its not too hilly. If you have any questions about what might suit you please contact us and we’ll be happy to talk things over to find what’s right for you. Yes, we offer a discount of 10% for groups of 4 or more. Can we add extra nights? We can always organise extra night’s either at the start or end of the holiday, subject to availability. Please contact us to discuss your requirements. Can I make changes to my holiday after I have booked? What happens if Byway’s Breaks have to cancel or make changes? You may pay for your holiday by cheque (made payable to Byways Breaks), debit card (Visa or Delta), credit card (Mastercard, Visa). You may also pay by bank transfer. Please contact us if you wish to pay by bank transfer. Do you cater for single people? Yes we do. There is a single supplement for people walking or cycling alone. Our prices are calculated on the assumption that two people will be sharing a room. The single walker supplement covers the extra costs incurred by booking a single room or single occupancy of twin or double rooms. In addition, it covers the costs incurred by transferring one rather than two sets of baggage. For single people walking as part of a group, the single supplement will just be the additional costs of a single room. When will I know where I am staying? Once we have confirmed your bookings and received your booking form and deposit, we will send you a booking confirmation which will have details of all the places you will be staying. Breakfast each day is included. On a few walking holidays packed lunches are included. On most holidays packed lunches and evening meals are not included as we find people prefer to make their own arrangements. Most accommodation is in towns or villages where there is a choice of places to eat in the evening and we provide advice and guidance about the best options in the route notes. Vegetarian meals are widely available and other diets like gluten free can be catered for at most places. 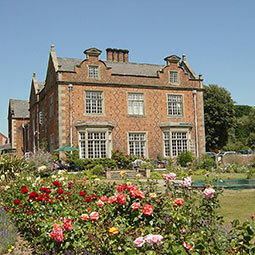 Please tell us of any particular requirements when booking so we can let B & Bs and hotels know in advance. You can leave your car at the hotel or B & B car park at the start of your holiday. Generally there is no charge for this service. For the accommodation booking and luggage service parking is not included but contact us as we can usually give advice about the options for a particular walk. Cheshire, Shropshire and the Welsh borders has good road and rail links. Most holidays are accessible easily by train and there are stations in Chester, Shrewsbury and Whitchurch in Shropshire as well as many other local stations. London is only 2 hours from Chester by train, Leeds and Sheffield are also about 2 hours. If booking in advance there are many cheap ticket offers. Manchester airport is only 45 minutes from Chester and Liverpool is less than 40 minutes. Airport transfers can be arranged. Detailed instructions on how to get to the start of your holiday will be sent to you in your holiday information pack. For walkers using the Accommodation Booking and Luggage service, there are easily accessible stations, on most of the trail walks. We can help with car parking arrangements and taxis to collect you from stations - please e mail or give us a call. Our bikes are hybrid tourers (generally Claud Butler). They are a comfortable bike, suitable for roads and also gravel paths on towpaths etc. We have bikes with women’s and men’s frames. We have a few children’s bikes but we tend to find that children are often more comfortable on their own bike. Handlebar bags, helmets and tool kits are supplied. The bikes used on the Anglesey cycling tours will also be hybrids although the manufacturer will vary. Unfortunately we do not have any electric bikes. 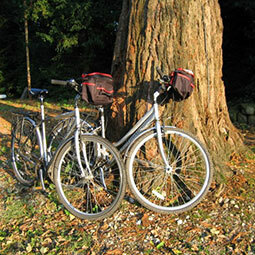 Our prices for cycling holidays include bike hire but many people bring their own bikes and we’re happy to give you a discount if you do, of £8 per day on short breaks and £10 on longer holidays, If you do bring your own bike you must make sure it is in good repair and have spare inner tubes etc, Byways Breaks cannot be responsible for customers own bikes, however we will try and help if you have a problem. You do not need to be super-fit to enjoy one of our holidays, they are pleasurable, not an endurance test! You do have all day, and if you do not regularly cycle or walk one of the gentle options is easily manageable for most people. Routes are graded (gentle, moderate or strenuous) and flexible so there's something to suit all ages and abilities. If you do not cycle or walk regularly it is a good idea to do some preparation before you come on the holiday and then you will find the first couple of days more pleasurable. Travelling light means you will have a relaxed time. All you need to carry each day is money, camera, snacks, water, waterproofs, first-aid kit and things you need for the day. We will take the rest of your luggage to your next overnight stop. Luggage is usually moved in the morning and should be at your next nights’ accommodation by early afternoon. We do ask you not to pack valuable and/or fragile items in your and there is a weight limit of 18kg per bag and one bag per person. On cycling holidays special equipment is not necessary. It is best to wear brightly coloured clothes so you will be seen. Wear comfortable clothes that allow you to move freely are good, particularly your legs. So avoid tight non-stretch trousers or jeans which have thick seams and can be uncomfortable. It’s better to wear layers, rather than one thick top. Suitable footwear, like trainers or something with rigid soles are good, A waterproof is a good idea. Before your holiday, we are always on hand to answer email or phone queries either while you are deciding which holiday is suitable for you or after you have booked with us. Our holiday information packs are thorough and easy to understand and you will receive these about 2 weeks before the start of your holiday so you have plenty of time to look through it and speak to us if you have any queries. When you arrive for a cycling or walking holiday (not the accommodation booking and luggage service) we always try and meet people to deliver bikes if they are using our bikes, and to run through the arrangements for your holiday. 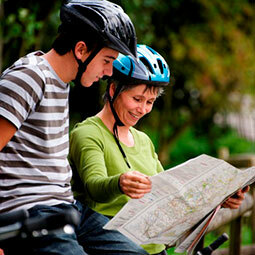 Sometimes on walking holidays or if you are using your own bikes we may speak to you on the phone. Our holidays are independent and self-led so while we are on hand to answer any queries; we will not interfere in your holiday but can be contacted by phone between 8.30am and 6.30 in the evening should you need any help. Before your holiday, we are always on hand to answer email or phone queries either while you are deciding which holiday is suitable for you or after you have booked with us. Our holiday information packs are thorough and easy to understand and you will receive these about 2 weeks before the start of your holiday so you have plenty of time to look through it and speak to us if you have any queries. When you arrive for a cycling or walking holiday (not the accommodation booking and luggage service) we always try and meet people to deliver bikes if they are using our bikes, and to run through the arrangements for your holiday. Sometimes on walking holidays or if you are using your own bikes we may speak to you on the phone. Our holidays are independent and self-led so while we are on hand to answer any queries; we will not interfere in your holiday but can be contacted by phone between 8.30am and 6.30 in the evening should you need any help. On walking holidays you must wear appropriate footwear. Walking boots are essential on long distance trail walks and walking shoes are fine or shorter walks. They should be ‘worn in’, not new. Good walking socks and a waterproof are also essential, whatever time of year it is. Several layers are better than one thick layer. You do not need to be super-fit to enjoy one of our holidays, they are pleasurable, not an endurance test! You do have all day, and if you do not regularly cycle or walk one of the gentle options is easily manageable for most people. Routes are graded (gentle, moderate or strenuous) and flexible so there’s something to suit all ages and abilities. If you do not cycle or walk regularly it is a good idea to do some preparation before you come on the holiday and then you will find the first couple of days more pleasurable. Travelling light means you will have a relaxed time. All you need to carry each day is money, camera, snacks, water, waterproofs, first-aid kit and things you need for the day. We will take the rest of your luggage to your next overnight stop. Luggage is usually moved in the morning and should be at your next nights’ accommodation by early afternoon. We do ask you not to pack valuable and/or fragile items in your and there is a weight limit of 18kg per bag and one bag per person. It is possible to take dogs on some of our walking holidays. Please contact us by telephone or email and we can advise which walks we can accommodate dogs on.